In 1950, Sam Walton, founder of the Wal-Mart empire, arrived in the Bible Belt town of Bentonville, Arkansas, and discovered that the nondescript Ozarks backwater–population 2,900 white Christians–suited him just fine. Today, six decades later, Walton’s legacy has left its mark. The Bentonville area is headquarters to not only Wal-Mart but also Tyson Foods and J. B. Hunt. The town’s population has grown to around 30,000, and the region is now home to blacks, Jews, Muslims, Hindus, Marshall Islanders, and the fastest-growing Latino population in the country. 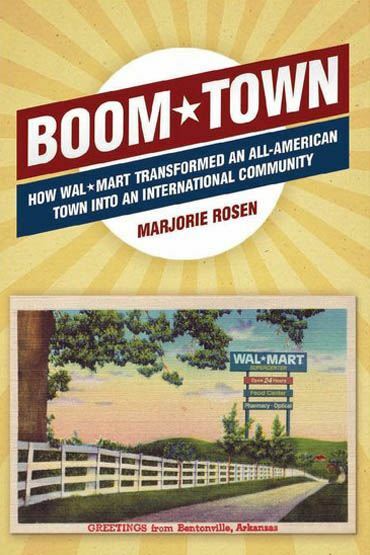 In Boom Town: How Wal-Mart Transformed an All-American Town into an International Community, veteran journalist Marjorie Rosen explores the ever-shifting social, political, and cultural character of the United States through the microcosm that is Northwest Arkansas and the personal stories of its people. Rosen talks with a Palestinian immigrant who rose from penniless dishwasher to multimillionaire contractor–and dedicated himself to building a local Jewish community’s first synagogue. A black executive hired to diversify Wal-Mart, whose arrival coincided with a KKK rally in the town square, gives his views on the controversies surrounding the company. A Mexican mother of three, fired from a chicken plant after an injury on the job, discusses her struggle to survive. A Hindu father concerned about interracial dating, a Marshallese security guard whose daughter was ignored in the ER, and many others reveal the issues and challenges facing those who make up the “boom towns” where the economy and culture are in constant flux. An entertaining, intimate, and often moving chronicle of how different ethnicities, races, and religions come together and struggle to adapt, Boom Town combines sociology, drama, and humanity to illustrate the unpredictable movements that shape our national persona.